Spring is nearly here! So get those Pastels out! 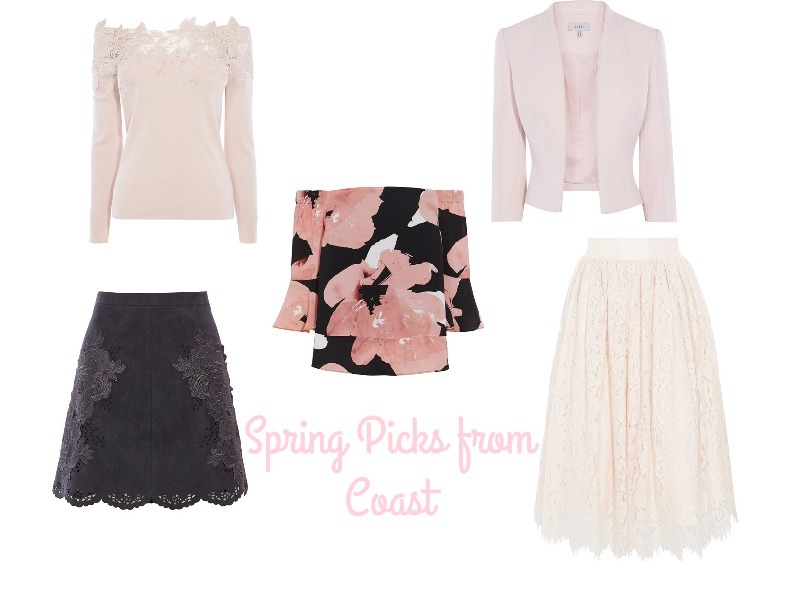 I thought i'd share some of my favourite pieces from Coast this Spring as they have some gorgeous bits. Spring fashion is always very pastel and pretty. I'm loving the lace and pretty florals! How cute is this blush pink lace bardot top, it's just so nice and would be so easy to wear either with some skinny jeans or tucked into a pretty skirt. I love this grey lace skirt, it would be so versatile and dress us any tops. Grey is one of my favourite colours right now. I really love the bardot style tops and think they are going to be so perfect for Spring, they can be so flattering! This floral one is lovely! I love the bell sleeves! A pretty jacket like this is perfect for those Spring weddings and as a cover up over your pretty tops. How cute is this floaty lace blush pink skirt? I think its so pretty and would be really easy to dress up for a wedding or another occasion. I would wearing this with a white or black 3/4 sleeve top for the spring season or you could wear a blush pink lace top so it looks like a dress for more of an occasion. What are your favourite trends for Spring? I'm so excited for Spring and Summer to get here, i'm bored of the cold and wet weather!